Kid approved, this cashew based mac and cheese is so easy to put together and will be ready in under 1 hour! Pasta: Bring a large pot of water to a boil, cook your noodles and set aside. Bread Crumbs: While waiting for the water to boil, start with your bread topping first. I toasted two pieces of bread we had on hand really well and processed them in the food processor until crumbly, a high speed blender will work too. Place the crumbs in a small bowl, drizzle with olive oil and a twist or two of the salt grinder, mix well and set aside. Quickly rinse the processor/blender bowl and move on to the cheese sauce. Cheese sauce: In food processor/blender, combine all of the cheese sauce ingredients and blend until creamy. Add more water, a tablespoon or so at a time, and blend again. Taste for flavor adding anything extra to suit your taste. Assemble: Once pasta is cooked and drained. Add pasta back to the pot it was cooked in, add the cheese sauce and combine well (you can also mix it together in the baking dish). 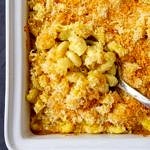 In baking dish, pour mac & cheese and top with bread crumbs. Bake: Place in oven for 20 – 25 minutes, check after 15 minutes if crumbs are darkening too much for your liking, cover with foil. When done, let cool about 10 minutes and serve. The sauce will thicken upon standing. *Two ways to soak cashews: Soak in cool water for 2 – 3 hours OR soak in very hot water for 5 minutes. Drain cashews and rinse before using. If you use a smaller baking dish or use ramekins, lessen the cooking time to 10 – 20 minutes depending on the size of dish you use. The chili pepper adds a really nice flavor without being too powerful. If your worried about the spiciness, especially for the little ones, I would suggest using the smaller amount, taste and add more if desired. To make this gluten free use gluten-free pasta.